Lots of people have written good blogs reflecting on the events of the 17th & the sessions they attended. But, like last year, I’d like to reflect on the messages I’ve taken away from TLT15. As always I was excited in the run up to TLT, as well as feeling exhausted. It’s silly but so few of us really share what we find on Twitter and at events with our colleagues and it’s probably for a wealth of reasons. Personally, I was worried about exposing myself as a Teacher Geek and annoying people. As well as having petty moments of getting annoyed at the one way sharing of ideas & resources (both found & ones I’ve created). But I am going to take this challenge away and I am going to keep it going all year; although I may ration out what I find and only send it when the unit is upcoming! Perfectly bookending the day, the closing session was delivered by Chris Waugh (@eductronic_net). As much as Stephen made us laugh with his story telling prowess, Chris made us understand something deeper about why we teach and why we attend events like this: we are there because of love. It’s true. We love our students, as they quickly become our kids; we love our subjects; we love teaching. But I think it goes even deeper than that: we love each other. I have to admit that I love people watching and the main thing I saw on Saturday was the bonds between everyone. These could have been virtual bonds made real (Receiving a hug from Jill Berry still feels the equivalent of getting a hug from a Hollywood A lister!) or bumping into an old friend / colleague or meeting people for the first time. During a few quiet moments, I took the time to look around me and saw people chatting and laughing and making friends. This is such an important part of Twitter and events such as these. At times like this, when teachers are struggling and leaving our profession or feeling isolated or like they’re failing TLT (and similar events) create beacons of hope and solidarity that lifts our spirits. This year the comradery felt so strong that it was in the air; it permeated the whole event. As always, I learnt a lot from the 4 sessions I attended and am already looking for ways I can improve my practice as a result. But, with a larger amount of stalls at lunch time and a bustling genius bar I took away so much from the event. But also felt humbled by how many people had spent their time creating stalls & resources to share their work with all of us for no recompense except a thank you and a possible Twitter follower. 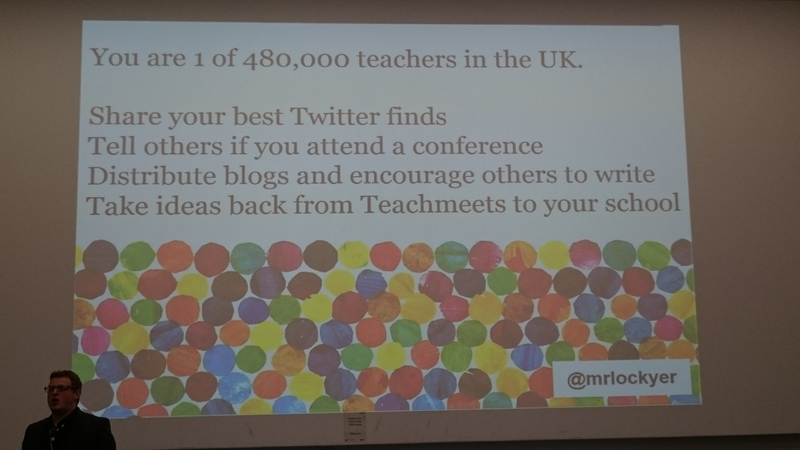 As mush as I have retweeted and emailed blog posts from #TLT15 and would encourage everyone to seek out everything that comes from that wonderful event. My biggest take away from the Takeover is the spirit, generosity and love from the teachers. And it is that which I will continue to share with my department, school and students because from that only good things will come from it.